I’m happy to announce, Practical Conscious Creation: Daily Techniques to Manifest Your Desires, has won yet another award…2012 Independent Publisher Book Award (Inspirational/Spiritual Category) Grab your copy! 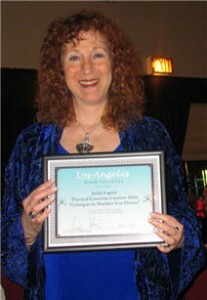 Practical Conscious Creation: Daily Techniques to Manifest Your Desires by Jackie Lapin (Findhorn Press) has been named best spiritual book of the year by the Los Angeles Book Festival. That award comes on the heels of Practical Conscious Creation being singled out for a Pinnacle Achievement Award, presented by the North American Bookdealers Exchange. Practical Conscious Creation breaks new ground by providing a manual for applying Conscious Creation principles on a daily basis to anchor those practices and speed up the manifestation process. The international bestseller has previously been ranked as Amazon.com’s #1 Hot New Release. The book is the second in Lapin’s Practical Conscious Creation series. Her first book The Art of Conscious Creation, a No. 1 Amazon.com bestseller, also widely acclaimed, and was a finalist for the USA Book Award, The Visionary Award and the National Indie Excellence Awards. Practical Conscious Creation brings Lapin’s unique take on Conscious Creation down to the cellular level—charging each day with Practical Conscious Creation wisdom–employing this powerful form of inspired thought in all actions, decisions, and routines. Practical Conscious Creation provides a methodology for reenergizing and reempowering your daily experiences, making them the engine for the change you intend. Filled with specific and imaginative practices, Practical Conscious Creation teaches you how to use the Law of Attraction with Conscious Visualization to proactively choose your future, rather than merely passively waiting for something to happen. Seventy articles provide the step-by-step actions to achieve a greater sense of empowerment and a more satisfying lifestyle. Readers will discover chapters on Trust and Expansion, Wealth and Prosperity, Conscious Living, Compassion and Love, Romance and Relationships, Business, Health, Happiness and Peace, Clarity, Personal Expression, Daily Application and more. Between each of the 70 individual articles are additional short tips that mirror the topic’s chapter. Join me at the Conscious Life Expo at the LAX Hilton, I’ll be signing books this Saturday, Feb. 11 at 10-11:30 a.m in the Findhorn Press booth. Bring a friend…hope to see you there! Recently my physical trainer gave me an ultimatum: only one “I can’t” during a session. The second one earns me extra repetitions! When you are lifting huge weights and you are fatigued, you really have to think twice about uttering that “C” word. By nature, people are self-limiting. We seem never to have enough faith or lack of fear to push beyond the point that we envision for ourselves. As my trainer Jack has shown me, I can do more than I think I can if I just do it slowly and carefully, increasing a bit each time. So I challenge you to go 30 days without saying “I can’t.” And set a consequence for each time you do. I guarantee this will make you think twice about limiting yourself and it will open up new horizons and new self-confidence. Most of all, it will make you a more positive high frequency person! It is only through facing our fears and difficulties that we can find creative and effective solutions. www.manifestbooks.com, where this book is available.